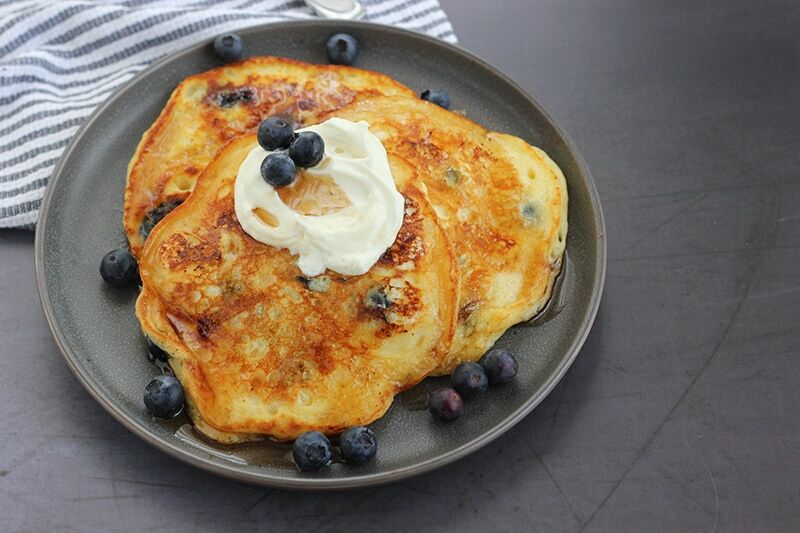 Start your day with the most incredible Blueberry Cream Cheese Pancakes! 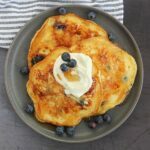 These pancakes are super fluffy and soft and made with buttermilk, fresh blueberries, and cream cheese! It is a tradition we started ages ago. Mostly because my child requested pancakes EVERY. SINGLE. DAY. So now we enjoy pancakes on Sunday’s. And Sunday only. Except after this recipe I am seriously questioning my decision to limit to one day a week. It is literally like you are eating blueberry cheesecake for breakfast. Which is always ok in my book. But I really expected nothing less from my girl Chrissy. I pretend we are friends because… Who wouldn’t want to be in her life?? Anyway, I have started a massive cookbook collection and wanted to start sharing a few of my favorites. Both of hers are super high on my must-own list. The recipes are nothing short of spectacular and always go over well with my family. 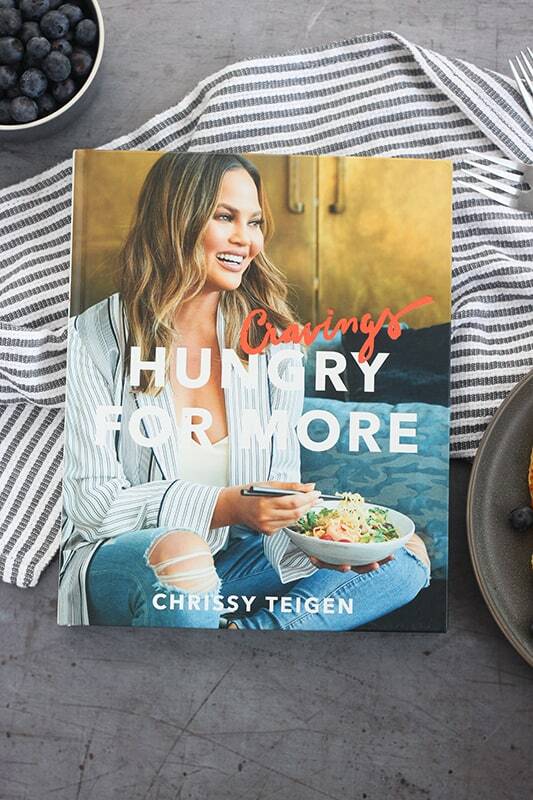 I’d suggest starting with the original Cravings and moving on the Cravings, Hungry for More. They are filled with so many great recipes and the photos are stunning! Use room temperature ingredients. This will help everything incorporate easily giving you a well balanced batter. Mix by hand. Over mixing you batter can result in chewy pancakes instead of light and fluffy. You want to mix just until the wet and dry ingredients are blended. 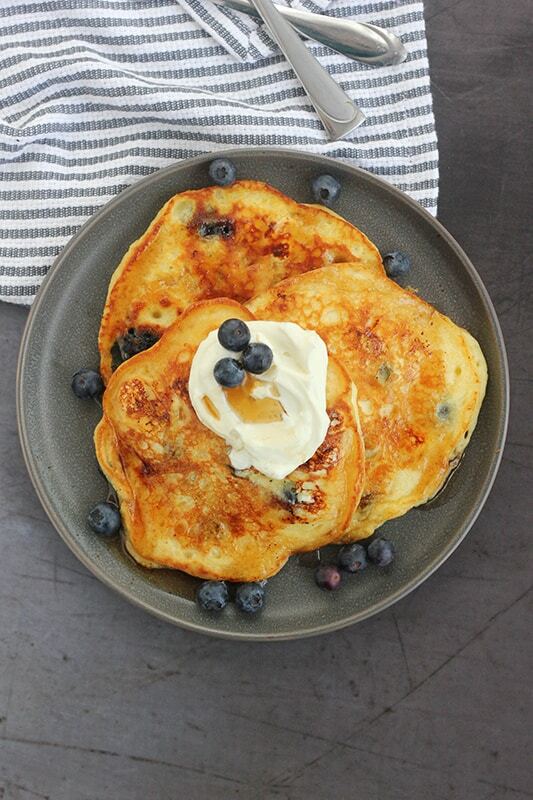 Can you use frozen blueberries in pancakes? Yep. I use fresh blueberries whenever possible. However, I have been known to pick up a pack of frozen berries on occasion. This is especially useful when it is the off season and quality berries aren’t available. 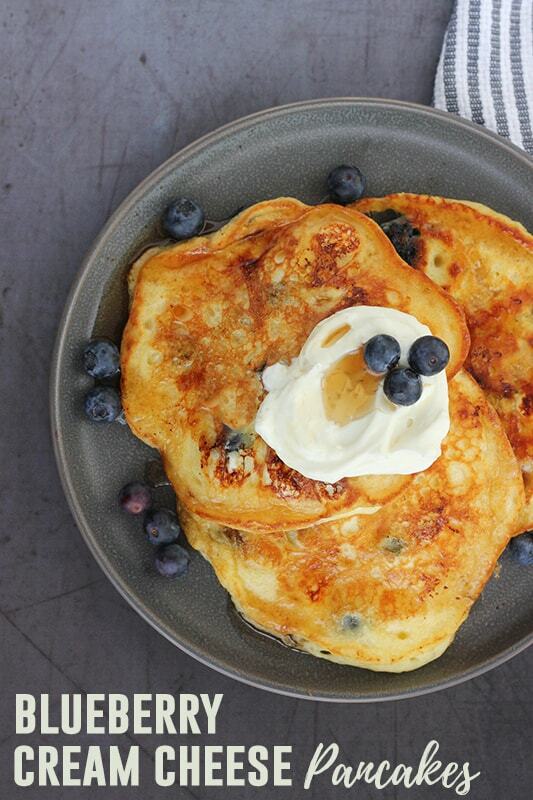 Can you freeze blueberry pancakes? The beauty of this recipe is that it is 100% freezer friendly. We store ours stacked with a small sheet of wax paper between each pancake and in a zip top bag. Frozen pancakes taste the best if used within 1-2 months. Chrissy suggests topping with graham cracker crumbs. We did not have any available so I skipped this ingredient. That being said, most likely we will try them next time! I’m sure it adds to the cheesecake flavor this breakfast has. Chop your cream cheese small-ish. It is a little time consuming but so worth it. Wash your berries and make sure they are dry before sprinkling into your pancake batter. Start by cutting the cream cheese into 1/4 inch cubes. Place in the freezer. Whisk together the all-purpose flour, sugar, baking powder, baking soda, and salt in a large bowl. Melt 1/4 cup of the butter (1/2 of a stick) in a small bowl. Cool slightly. 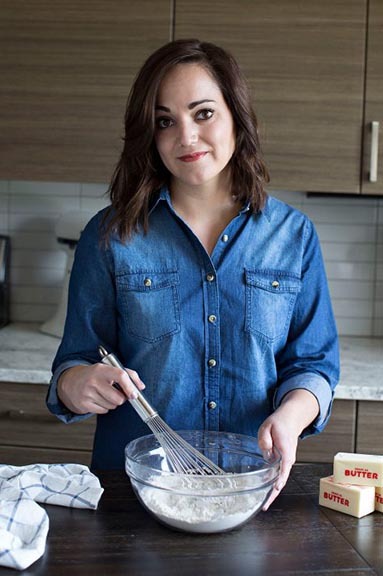 In a separate bowl, whisk together the buttermilk, eggs, and vinegar. Add the melted butter. Stir the wet ingredients into the flour mixture until just combined. Fold in the cream cheese cubes. Heat a griddle or skillet over medium heat. Use the remaining butter to grease the pan. Pour 1/3 cup of the batter onto the pan. Sprinkle with blueberries. Cook until tiny bubbles appear in the pancake and the edges slightly curl. Flip and continue to cook 1-2 minutes or until golden brown. 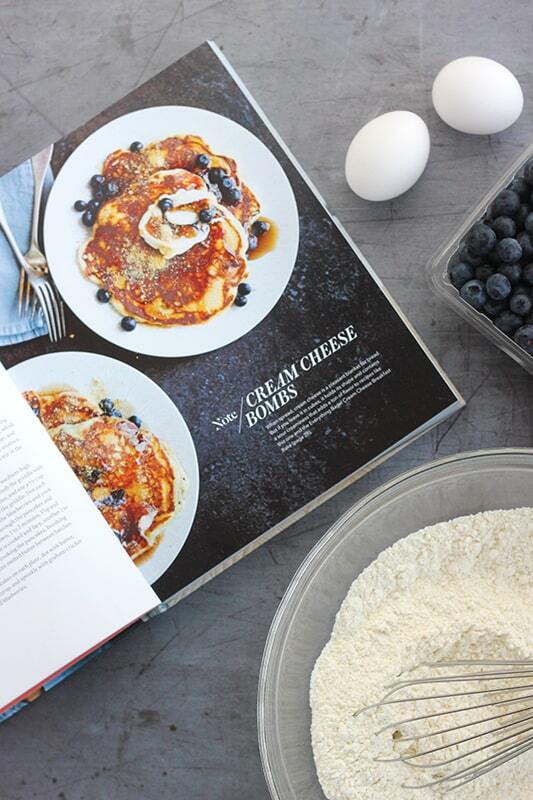 Serve the pancakes with crushed graham crackers, butter, syrup, or extra cream cheese!